Here's a LKF in celebration of the opening of Bohemian Rhapsody: Innuendo, Queen's final studio album, marked the only time a guitarist other than Brian May appeared on one of their albums. Steve Howe of Yes performed on the title track. The world's largest pyramid is located in Mexico. reminded me of this, BB,.. this one's got a humungus, 'what if', hanging over it. 1916, The Mexican government fractured, the country in civil war,.. peasant leader Pancho Villa was a powerfull force. Villa led a raid against a small U.S.–Mexican border town, and then retreated to escape U.S. retaliation. The U.S. government sent U.S. Army General John J. Pershing on an expedition to capture Villa, but Villa continued to evade his attackers with guerrilla tactics during the unsuccessful, nine-month incursion into Mexican sovereign territory. The mission ended when the United States entered World War I and Pershing was recalled to other duties. I've read that Pershing chased Villa deep into Mexico, and ended up perfectly positioned to seize the Capital, Mexico City,.. and potentially claim all of Mexico for the U.S.,.. and he might have gone for it,.. but WWl started and Pershing was recalled. In 1891, General John Joseph Pershing, then a second Lieutenant in the Sixth Cavalry, became Professor of Military Science and Tactics at the University of Nebraska at Lincoln. Wishing to improve the morale of the ROTC unit, he formed a select company of men, thereafter known as "Company A." In 1893, the special drill company became a fraternal organization bearing the name of "Varsity Rifles." In 1894, the organization, in appreciation of the initiative and cooperation of Lt. Pershing, changed its name to "Pershing Rifles." Pershing Rifles Company D-17 at LSU functions as the rifle drill team and color guard for the Ole War Skule. These units perform at home football games, LSU Corp of Cadets activities, and many other official functions. The Pershing Rifles has four main missions: (1) to aid in the development of successful officers in the Army, Navy, and Air Force; (2) to foster camaraderie and esprit de corps among all three Reserve Officers’ Training Corps programs; (3) to further the purpose, traditions, and concepts of the United States Army, Navy, and Air Force; (4) to give civilians an opportunity to be part of a military organization without a formal commitment to the military. The word ukulele means jumping flea in Hawaiian. A young eel is called an elver. 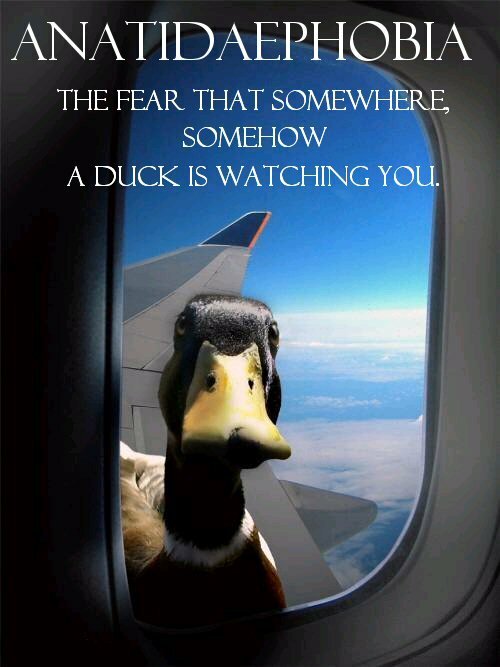 Anatidaephobia is the fear of ducks. That thing looks like what would happen is Squidward and the Pink Panther had a kid.